Ronny Jackson, the White House physician since 2006, was scheduled to be considered by a Senate committee Wednesday, but the hearing was abruptly postponed. WASHINGTON – His nomination in peril, Veterans Affairs nominee Ronny Jackson fought Tuesday to convince lawmakers of his leadership abilities as more details emerged over his alleged misconduct, ranging from repeated drunkenness to a toxic work environment, as he served as a top White House doctor. President Trump sent mixed signals about his choice to lead the sprawling veterans’ agency, suggesting during a White House news conference that Jackson may want to withdraw because of unfair scrutiny. But the president privately urged his nominee to keep fighting to win Senate confirmation, and Jackson showed few signs of backing down. “There is a severe and pervasive lack of trust in the leadership that has deteriorated to the point that staff walk on ‘eggshells,’” the assessment said. The audit appeared to contradict public statements from Jackson, who declined Tuesday to answer reporters’ questions about the allegations. He gave no indication he would withdraw and denied the existence of any inspector general report detailing troubling behavior. After the Senate Veterans Affairs Committee abruptly postponed his confirmation hearing, which had been set for Wednesday, Jackson visited lawmakers to assure them he is fit to lead the VA. 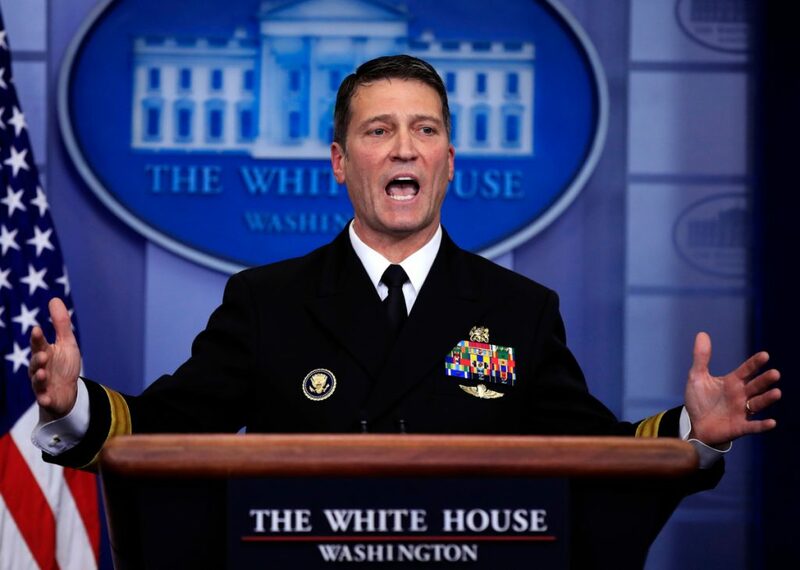 The White House also disputed allegations that Jackson improperly administered medication, saying the medical unit passed regular audits by the Controlled Substance Inventory Board. Detailing the allegations to NPR, Sen. Jon Tester of Montana, the committee’s top Democrat, said more than 20 current and retired military personnel had made complaints to the committee about Jackson. They included claims that Jackson was “repeatedly drunk” while on travel with Obama and that on overseas trips he excessively handed out prescription drugs to help travelers sleep and wake up. Jackson is also accused of creating a “toxic work environment,” Tester said.